The Force set up the Video Production Unit (VPU) as early as in 1979 to tie in with a growing demand for video media training. 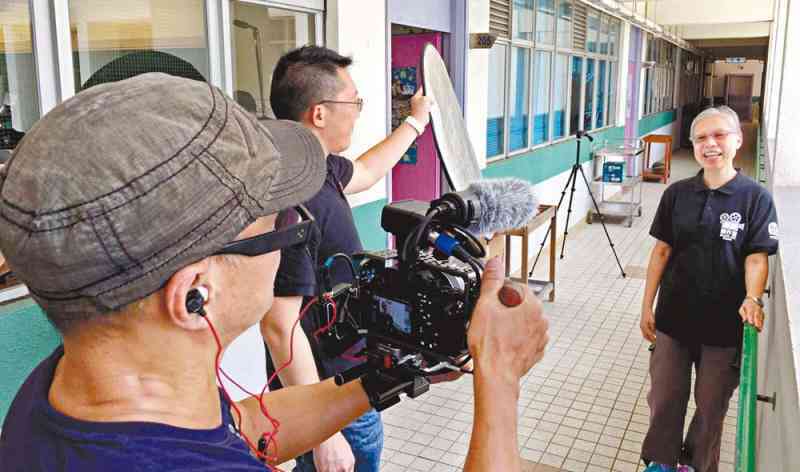 This issue of OffBeat invited the supervisor of the Learning Technologies Division (LTD), Superintendent Yip Kai-hung, and Programme Officer (Video Production) Tam Yiu-hung to share their work experience with readers. In the early days of the VPU which was under the scope of LTD, it was mainly responsible for the production of training videos for police recruits to enhance teaching efficiency. Following a spate of serious armed robbery cases in the 1990s and the Force's response strategy to reinforce firearms training for officers, the VPU has taken up a new task to produce simulated videos regularly for the Mini-Range Training System. In addition, the VPU offers supportive services during the Force's major activities. Mr Yip said, "Members are required to perform duties frequently to arrange documentation of key events of the Force." The VPU has adopted a three-tier structure of supervision, planning and production: the supervisor takes a monitoring role to ensure that the production reflects the Force's values; the Programme Officer is responsible for planning the entire production process and, together with the supervisor, gives advice on film production; a Senior Inspector co-ordinates production for different units; and four Technical Officers take up film shooting and post-production work. In contrary to general television staff who follows the principle of "division of work", the VPU pays due regard to the diversified talents of their personnel, who have expertise in lighting, audio recording, film shooting, directing as well as editing. Hence, the VPU is more flexible in the allocation of assignments, enhancing the effectiveness of the unit. 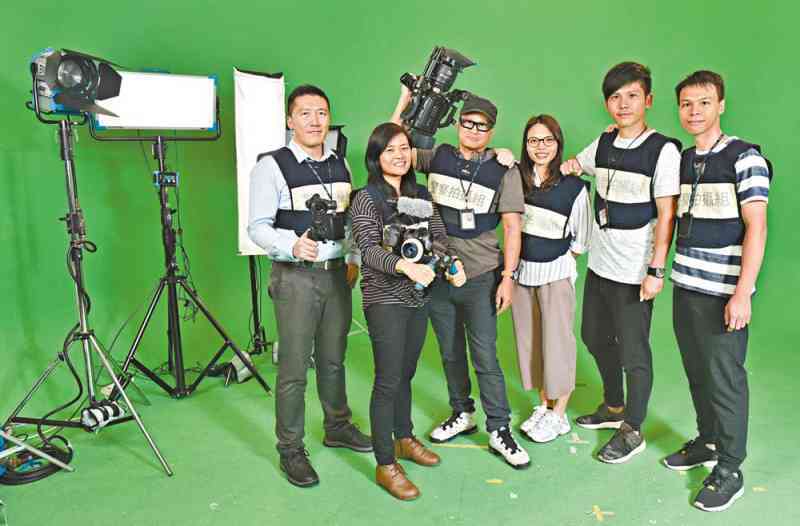 With the continuous advancement in technology, video equipment becomes increasingly popular and the VPU needs to support other formations in meeting their film production needs. Mr Tam explained, "Our unit would run a filming course for these officers. If other formations need to procure video equipment, we would offer professional advice to them." In addition, the VPU has set up a Music Library and would lend video equipment to other formations to make full use of resources. The VPU produces promos from time to time to project a positive image of the Force to overseas and local partners. They have won a number of awards, the latest of which is the Silver Award in the "Promotion Video" category of the Galaxy Awards 2017 for their promo about the Police Museum. Two other promos titled "Police College Flying the Force Colours" and "Days and Nights" clinched the Bronze Award in the Questar Awards (Non-Profit Organisations Category) in 2016 and 2017 respectively. Furthermore, a promo entitled "Asia's Finest" won the 2010 Mercury Awards - Bronze Award (Promotional/Documentary). Mr Tam said, "Through liaison with officers, members of the unit fully understand the culture of the Force and would incorporate these values into their works with a view to featuring the Force as a professional and committed team." Mr Yip mentioned that the VPU is also responsible for making video documentation of the Force's major operations to facilitate other officers in conducting reviews. He added, "This is a very challenging work as we have to show the real-time scenarios of the operations and to take a balanced stand in showing details of the operations for viewers' reference." Looking back at his 28 years of service in the VPU, Mr Tam said, "I am pleased that with the sustained improvement of our equipment, filming technology and quality of production, we have earned recognition from officers as 'elites of the professional teams'." Mr Yip shared his vision of the VPU with OffBeat, "We would continue to strive for excellence and lend full support to officers. Consideration is actively given to the adoption of more advanced video techniques, such as stereoscopic imagery and virtual reality filming. I hope that officers would take pride in the VPU's professional performance and VPU members are proud of serving in the Force."